I'm writing about white feathers today. No doubt you've heard such stories previously. Some say they are from angels. Perhaps a Guardian Angel. Personally I have no idea. I haven't reached a definite opinion about angels and/or white feathers but the following is something that happened to me. The first time I experienced white feathers was when I bought a new car. There on a grass verge next to my car, when I went to collect it, were three white feathers, all lined up next to each other. I read afterwards that finding three feathers is supposedly your Guardian Angel letting you know they are about. As, I've already indicated, I'm not sure if this is true. The car purchase was a little odd because, being me, I shopped around for the best price. I took ages deciding and then finally, to my wife's disappointment, reached the conclusion that the car I wanted was slightly too expensive. Nevertheless the next day my wife was seeing one of her dress making clients. In the general chat my wife mentioned the car I was thinking about buying. Now by chance / coincidence, or whatever, the client said she had a friend who was a car dealer and sold this particular make. She went on to say he was desperate for a few sales otherwise he could lose his dealership. Seemingly he had to sell a target number of cars each quarter. 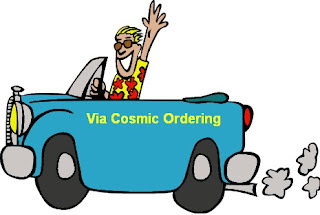 So, to sum up, I'd asked the universe / cosmic, or whatever you want to call it, for a car at a certain price and I got it. 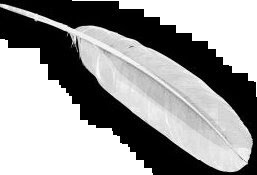 Then, when I picked up the car, there were three white feathers lying next to it - a message of confirmation perhaps from a higher level? Or just my imagination? In my next post I'll carry on with the white feather theme as, after this, I then began to see many more of them following the deaths of people close to me. "Dad once said to me that should he pass away, if there was some way of letting me know he was going to be okay - that we were all going to be okay - the message would come to me in the form a white feather. Then something happened to me about ten years ago when I was on tour in Australia. I was presented with a white feather by an Aboriginal tribal elder, which definitely took my breath away." This is interesting Mike, last night I was listening to an audio by Eva Gregory about spirit guides and angels. I have often encountered white feathers but I did not know about the connection to angels. I will start paying closer attention now. Carol: I must admit I'm not sure as to the reason for the white feathers. As you'll see in my next post my wife and I continued to see them at an emotional time - some will therefore say it was us 'needing' something to cling on to. I don't know about the angels part, but the feathers certainly seem significant. One feather, ok, not meaningful. But when it keeps happening... wow.I think Pauli would call these serial synchronicities. Trish and Rob: I must say I'm not convinced about angels but the feathers became meaningful for us at a difficult time. Two weeks after my father passed my husband and I were driving down a road. It was a very cold snowy February day. I was still in mourning and thinking of my dad. Out of nowhere a white dove flew in front of our car. It actually almost hit the windshield. At that moment the thought of that being a sign from my dad popped into my head. I knew it was dad saying peace be with you. I felt relief from that point forward that dad is in a good place. My brother passed away 2 weeks ago aged 42 after only a 4 month battle with cancer. As a family we are grief stricken. I mentioned to my parents about the white feather theory, last Wednesday a flower came up through their patio slabs with a white feather attached. On Monday night, it was dismal and getting dark, I was feeling so upset when I happened to look out of the patio doors and a white feather floated down onto a planter. I was texting my brother's best friend last night, I suggested he look up the white feather theory online but didn't tell him we had seen any feathers. He visited my brother's grave today and beside the grave was a white feather. Three coincidences in just over a week? We didn't go out looking for them and didn't really expect to see them but we did. They have provided some small comfort. My beautiful Mom who was an angel on earth passed away unexpectedly Dec 2013.. Since her passing my brothers and sister & I have all received numerous white feathers. We had never heard of this in all our lives. They will float down out of the blue and usually when we are doing a good deed or just thinking about her. She has returned to being a beautiful, kind and caring angel. Love you Mommy. I have just had the strangest experience. I was out walking with my mum we happened to walk through a cemetry. We were just chatting when we noticed a white feather falling from a very empty sky. The fact we commented on it is strange as we go walking a lot and see feathers fallong a lot. This feather didn't just fall it began to float horizontally away from us above the gravestones. My mum said it would be strange if it landed on a grave stone. I said it would be really weird if it was the grave of someonewe knew. It then landed on the grave of mygreat great grandparents. We didnt even know they were buried in that cemetry. We both found it a very emotional experience. It is also my mums birthday tomorrow and her mums will was finalised today. Something even stranger though is that there is a psychic night being held in the pub that my great great grandparents lived in, in two days time. Both me and my mum are not big believers bit there is no getting away from the fact that someone wanted to tell us something. Im just not sure what the message is. My father passed away last year. I was devastated and feeling depressed. This year, started to come doves in my garden everyday in my life and I find white feathers around the garden most everyday. Basically, I need to clean my garden to collect the white feathers.